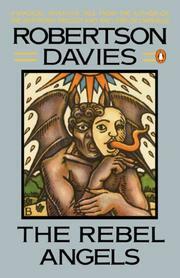 In this darkly funny scuttle through academe's more covert passageways, Davies--a veteran provider of civil entertainments who's ever Jung-at-heart--first edges his people into medieval archetypes and unexpected passions, then caps the Scholarly spectacle with a splendidly horrid murder. Remote in his eyrie at the Canadian "College of St. John and the Holy Ghost" (known as "Spook"), austere medievalist Clement Hollier is oblivious to the adoration of a lovely grad student: half-gypsy Maria Theotky. (Though once, inexplicably, he "had" her on the sofa.) And Maria's narration alternates with that of Anglican priest/professor Simon Darcourt, who, along with Hollier, is one of Maria's "rebel angels"-- those who "taught the daughters of men" after being exiled from Heaven. But she is also fascinated by the verbal stilettos of newly-arrived "Brother John" Pariabane: a Spook alumnus and self-de-frocked monk, a brilliant Doctor of Philosophy, an "important bum. . . a cultivated sponger," a bamboozler and mocking asp. So, while Darcourt chronicles academic monstrosities (including the prize-winning work of a modern alchemist working with human excrement) and Hollier boils with rage at nasty Renaissance scholar Urky McVarish (who has stolen a priceless Rabelais ms.), passions and jealousies brew. Soon there are even exotic visits to Maria's gypsy mother--as Hollier requests curses and Darcourt pants with love for Maria (due to a misdirected love potion). And finally: Parlabane, in a cloud of sulphurous malefactions, wipes Urky and himself from the Earth; Simon comes to his senses; Hollier recognizes love too late; and Maria settles for true love with a nice young rich man. Along the way Davies teases the modern scholars' "conventionality," playfully casting back to the saucy scholars of old. And though for rather a special audience, this is saucy stuff indeed--swept with vaporous invention and fertile with miraculous minnows of donnish wit.